A social experiment designed to gauge levels of anti-Semitism in Britain turned up some shocking results. Journalist Jonathan Kalmus set out to get a sense of anti-Jewish feeling in the UK by donning religious dress and visiting two UK cities. 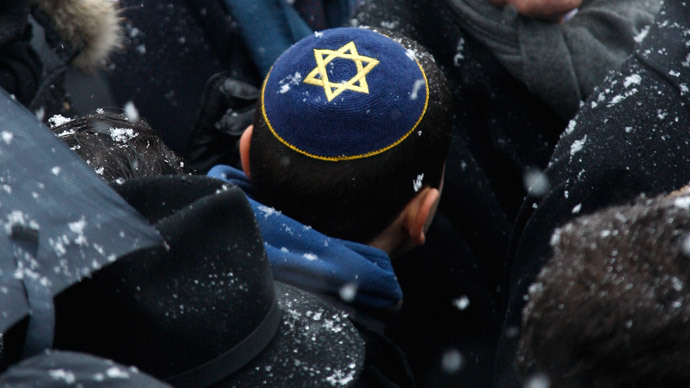 Wearing the traditional kippah head covering, he walked around the streets of Manchester and Bradford. He said he was almost immediately subject to anti-Semitic abuse. He heard slurs including “Fight the Jewish scum,” and was told: “Jew, Jew, Jew... Run.” The racist comments included, he says, those from a small boy who was walking with his father. In Bradford one passer-by spat at him, he claims. Oxford University Student Union (OUSU) voted down a motion on Thursday to break ties with the boycott, divestment and sanctions (BDS) movement in a move which was heavily criticized by some Jewish students. Ben Goldstein, who proposed the motion and was quoted in the Jewish Chronicle, argued the BDS movement “indiscriminately targets all Israelis.” The move was rejected by 72 votes to 30, with 28 people abstaining. Last Friday the students’ union of the School of Oriental and African Studies (SOAS) in London ruled on the issue as part of its Israeli Apartheid week. The union voted in favor of a full academic boycott of Israel. The poll involved over two thousand students and staff. The boycott passed by a margin of around 75 percent, with 425 students opposing the motion. The union has been associated with the BDS campaign since 2005. The SOAS branch of the movement featured centrally in the build up to the vote, calling for the referendum late last year. On Thursday Jewish students at SOAS complained of intimidation. One student was allegedly told to “f*** off to Israel,” while another said they are afraid to go to lectures or student common rooms for fear of being verbally abused. Some Jewish students claim the atmosphere on campus has become increasingly difficult since the BDS campaign began.